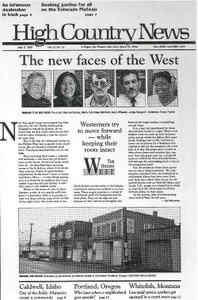 The series "The Hidden West" is High Country News' look at communities that are on the edge and often uncertain of their future. In Caldwell, Idaho, and other towns in southern Idaho, a growing Hispanic community is breaking old migrant-worker stereotypes and showing new economic and educational strength. Who loses when a city neighborhood goes upscale? Longtime residents of Alberta Street and other neighborhoods in Northeast Portland, Ore., have survived poverty and drive-by shootings and now face a new challenge in the growing gentrification of the area. As the nearby Big Mountain Ski Resort booms, service workers find they can no longer afford to live in what was once the working-class town of Whitefish, Mont. Farm worker advocate Maria Gonzales Mabbutt credits United Farm Workers' founder Cesar Chavez with inspiring her to help her people in Southern Idaho's Canyon County. The Western Water Workshop at Western State College in Gunnison, Colo., offers "Garden of Dreams vs. High Desert Reality: Can We Save Everything, Keep Our Lawns Green and Have Enough Water For Everyone?" July 28-30. The Political Economy Research Center offers fellowships in free market solutions to environmental problems. The Colorado Fourteeners Initiative is looking for trail-crew volunteers for weekends on Mount Harvard and Mount Bierstadt in Colorado. The Western States Center's annual training program offers community leaders a chance to learn about civil rights, the environment and labor, July 29-Aug. 1 in Portland, Ore.
John Day, Ore., hosts a renewable energy fair July 24-25. Charles Wilkinson's new book, "Fire on the Plateau: Conflict and Endurance in the American Southwest," is a tribute to the land and people of the Colorado Plateau, especially the Native American inhabitants. Rotting bison skulls in Red Lodge, MT; Werner Zink sells plastic lumber in Coos Bay, OR; BASE jumpers in Lake Powell; hot air in Denver; outlaw bur reed in Home Depot; ranchers' gun fight in Riverton, WY; Salt Lake City outlaws fun; advice from Ed Abbey. Perri Knize and cow statistics; visitors; Diane Sylvain's maps and Charles Wilkinson's book; odds and ends, ad policy and HCN takes a break. Notorious developer Tom Chapman is circulating a glossy brochure for the mansions he says he plans to build on former mining claims in Colorado's Holy Cross Wilderness. Will an experimental plan be snuffed out? Environmentalists are at odds over an experimental logging plan intended to restore forest health and reduce the risk of wildfire in the ponderosa pines around Flagstaff, Ariz. Controversy is rising over plans by artists Christo and Jeanne-Claude to suspend translucent fabric over four to six miles of the Arkansas River between Caûon City and Salida, Colo. The Montana Mining Association's lone remaining employee, Executive Director Jill Andrews, blames last November's initiative, which restricts open-pit cyanide heap-leach mining, for destroying her industry in the state. The Southern Utah Wilderness Alliance has not yet made up its mind on Gov. Mike Leavitt's 1 million-acre wilderness proposal for Utah's West Desert. The Montana Department of Fish, Wildlife and Parks hopes to restore the disappearing fluvial Arctic grayling to five rivers in the state. Montana farmer Brian Schweitzer launches a lively campaign for election to the United States Senate, running as a Democrat in a Republican stronghold. Race-car driver Travis Panko's plan to build a race track on a ranch near Stevensville, Mont., has many of his Bitterroot Valley neighbors incensed.